When is Usain Bolt coming to FIFA 19? It’s almost half a year since the first rumours of a Usain Bolt appearance in FIFA 19 began brewing, and we’re still no closer to the Jamaican making his series debut. For casual fans, that’s a sickener. Sprint speed remains the single most-chased attribute in modes such as Ultimate Team, so having the fastest man of all time available for Division Rivals use is naturally a tantalising prospect. FIFA 19 The Journey rewards – what do you get for finishing each chapter? Can I play as Usain Bolt in FIFA 19? As mentioned above, not yet. With a handful of exceptions – such as Icons in Ultimate Team – EA’s contracts only cover players officially registered with clubs featured in the game. Usain Bolt famously scored on his debut for Australian team Central Coast Mariners in October, but the match was a friendly against minor-league opposition. And weeks later, at the outset of November 2018, he left the team without a deal. That put us back at square one as far as his FIFA 19 debut is concerned. In January 2019 he then appeared to give up on the dream for good, saying, "The sports life is over, so I’m now moving into different businesses." When will Usain Bolt be added to FIFA 19? Most likely within a few weeks of him signing that elusive pro contract, assuming Bolt is still open to the idea after his apparent January retirement. For instance, Central Coast Mariners say the door is open to a return. "We weren't able to come to an agreement in terms," explained CEO Shaun Mielekamp to CNN," but we're going to keep trying to work together and keep communication, and you never say never." Central Coast aren’t the only team known to have an interest in Bolt. Maltese champions Valetta also offered him a deal, but his agent says it’s an opportunity he “does not wish to pursue”. That should be a relief to FIFA 19 fans. Malta’s Premier League has no deal with EA, and so Bolt relocating to the island nation would keep him in no-man’s-land from a videogame perspective. It's unlikely, but there's always a slim chance EA makes a bespoke deal, perhaps giving Bolt an Icon card, meaning he wouldn't need an in-game club. 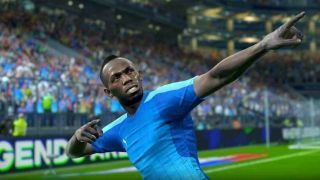 Cunningly, Konami rode a similar wave of public opinion and signed Bolt up as an ambassador for PES 2018. (Hence the screenshot at the top of this piece.) However, he’s not in PES 2019, which has led some to believe that a FIFA 19 appearance is coming at some point. Will Usain Bolt be scanned for FIFA 19? This is an interesting one, and possible setback if Bolt does sign a pro deal. There’s no way EA would want him in the game with a generic likeness, but also no chance he’s been scanned in the past given his exclusive deal with Konami last year. If he signed for Wigan Athletic tomorrow, would he want additional money for his videogame image rights? You’d imagine so. Would EA pay that money? Possibly, but not if it’s in the seven-figure range. What will Usain Bolt’s FIFA 19 attributes be? Good question. Perth Glory striker Andy Keogh describes Bolt as having the “first touch of a trampoline”. Meanwhile, the existing Central Coast squad, largely considered superior footballers to the Olympian, features only two players rated 70 or higher: former Leeds striker Ross McCormack and Dutch midfielder Tom Hiariej. So it would be unrealistic for Bolt to match his PES 2018 overall rating of 75 if he were to return to Oz. However, Bolt is more marketable than most other second- or third-tier footballers, and so some ‘embellishment’ of his abilities to make him feel like a must-own Ultimate Team card is likely – perhaps an overall of 68 or 69 and ‘rare silver’ card status. Like in PES, he’d surely have speed and acceleration stats of 99, which in itself would make him a highly sought-after FUT item. Has Usain Bolt’s FIFA 19 Ultimate Team card been leaked? There’ve been many rumours to that effect, with Fox Sports Asia apparently confirming that his card has been prepared. “If Usain is picked up by the Central Coast Mariners then he will automatically be included in the winter update or next major update,” the publication claims to have been told by an EA Sports source. “But if he isn’t listed then he might be included as a free agent. He will also be the fastest player in the game.” However, I’ve looked into this in detail and can say with some authority that all ‘leaked’ cards so far are fakes. Bolt the Olympian athlete currently has as many authentic Ultimate Team items as Bolt the Disney dog. Sorry. FIFA 19 is out now. Want to boost your FUT Team balance in preparation for Bolt’s possible arrival? Then check out our guide to making FIFA 19 Ultimate Team coins.